Last month, a Wall Street Journal op-ed posited that the new tax bill could create a mass exodus of roughly 800,000 residents from the state of California who will flee the state for low-tax red states. Taxes aside, a new report by Next 10 and Beacon Economics suggests the California exodus may get a lot worse, as new housing construction since the Great Recession has been tepid at best, and as a result, California faces a housing backlog of 3.4 million units by 2025 if the trend continues - and 2.8 million units at the current rate of construction. 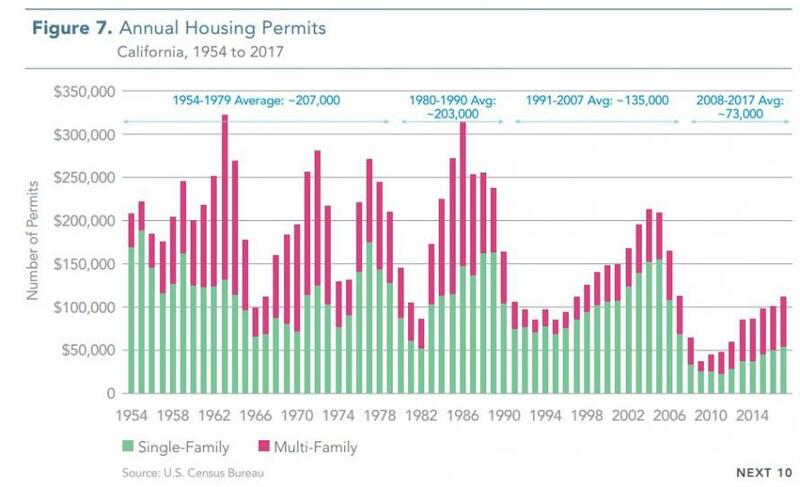 From 2007 to 2017, only 24.7 housing permits were filed for every 100 new residents in California – much lower than the U.S. average of 43.1 permits. "California’s current housing supply is not able to support its growing population," the report concludes, and as such "the low levels of construction will likely result in further increases in home prices, such that fewer and fewer California residents will be able to afford homes." According to the report, California lost over a million residents in the decade between 2006 and 2016, due primarily to the high cost of housing disproportionately hurting lower income households. Over 20% of those who moved over that decade did so in 2006 - at the height of the housing bubble. 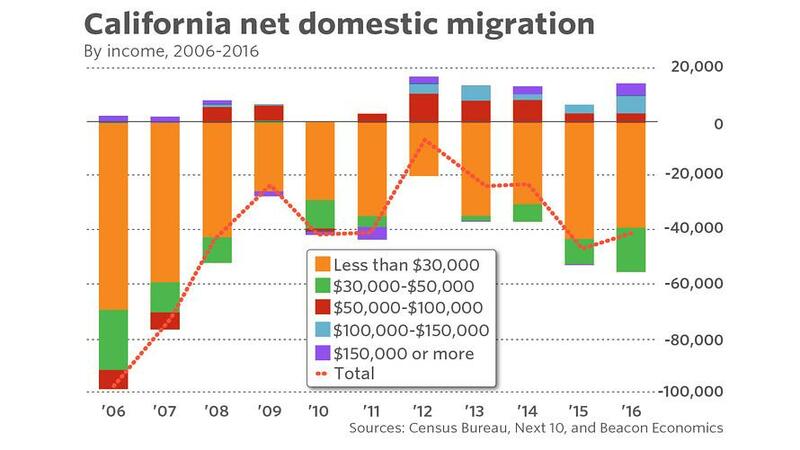 Meanwhile, migration out of California is mostly tied to income, as most of those leaving the state earn less than $30,000 per year. Crunched California homeowners spent an average of 21.9% of their income on housing expenses in 2016, while home ownership rates are terrible at just 53.6% of homes owner-occupied; the 49th worst in the nation on both counts. California renters meanwhile come in 48th in the nation when it comes to percentage of income spent on housing at 32.8%. And how are Californians coping with the skyrocketing costs of housing? One strategy is doubling up - as nearly 14% of renters have more than one person per bedroom, making it the state with the highest percentage of overcroweded renter households. In a separate analysis noted by MarketWatch's Andrea Riquier, "Realtor.com found that the number of people searching real estate listings in the 16 top California markets compared to people living there and searching elsewhere was more than double that of other areas — and growing." Searches for homes in pricey California towns - primarily Santa Clara, San Mateo and Los Angeles - experienced virtually no increase over the past year, while views of listings in other parts of the country were up 15%. So where do most broke Californians move? Texas, Arizona, Nevada, Oregon and Washington .